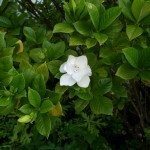 My gardenia bush is very large, about 15 years old, healthy and taking over the doorway. I want to remove about 2/3 of the bush. Can I do it now or wait until fall? It doesn't matter if it doesn't bloom next year, I just don't want to kill it. I have removed about a 1/3 already. Should I wait until it starts to put out new shoots before pruning more? You really do not want to remove more than 1/3 per year. Any more than this will put too much stress on the plant and will possibly kill it. At the very least, I would wait until early fall to prune again.